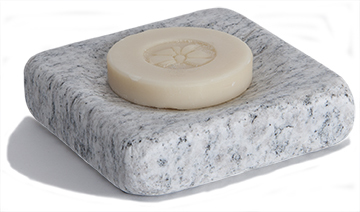 Our cove soap dish brings the beauty and feel of nature indoors. We create the visual and tactile experience of naturally weathered stone by carving and tumbling hand-cut granite squares. The unique colors and intricacies of each piece are revealed, creating visual warmth enhanced by smooth and textured softness. 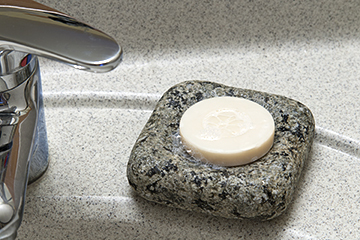 A subtle contoured nest contains the soap amidst the stone’s natural vibe and earthy hues. Can also be used to hold a pillar candle. Measures 4″x4″2″. Soap included.